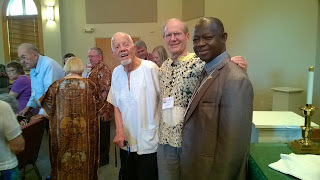 Bishop Yambasu, right; Darrell Reeck, blogger, center; Rev. Clyde Galow, left. United Methodist Church in Sierra Leone announces long-term aid to villages in the mudslide area. UMC will dig two wells; these will provide safe drinking water. The communities have no safe wells at this time. Further, the UMC will open a new health center at Kamayama--a mudslide-devastated town. There's no health center in the region currently. Source: The United Methodist News. Human tragedy in Sierra Leone knows no bounds! First there was the hinterland guerrilla war a decade ago. Later, the Ebola epidemic. Now: hundreds of persons washed away in a mudslide. Where in Sierra Leone did this tragedy occur? In an area known as the Peninsula--mountainous land that pokes out from West Africa into the Atlantic Ocean. The site of the giant mudslide is a few miles to the south of Freetown, the capital city. A minority of Sierra Leoneans are Christian and Church aid flowed to the victims immediately. This link takes you to United Methodist. 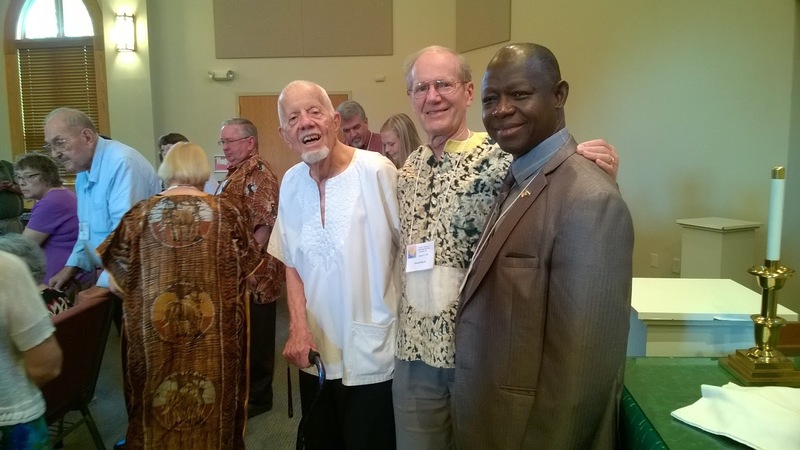 Slide photos and good talk from Bishop Yambasu in this link. Internationally, Qatar also sent aid. Photo: Suburban Freetown, 1960-61; Peninsula mountains in the background. The 2017 mud-slide happened on the other side of these mountains. If you can help, find information on donating securely to relief efforts at this link. Though Sierra Leone has suffered tragedy upon tragedy in the past couple of decades, I experienced there a wonderful cultural and community life. I was privileged to explore Sierra Leone as a college grad (enjoy reading about that adventure here) and then a few years later as a researcher. The second visit resulted in my doctoral dissertation and a PhD from Boston University. And in a book. I pray for Sierra Leoneans in this current tragedy and invite your prayers for them as well. As time heals the terrible wounds, some of the glory of life in Sierra Leone will surface. That is the hope. Labels: Helping mudslide victims, Sierra Leone.